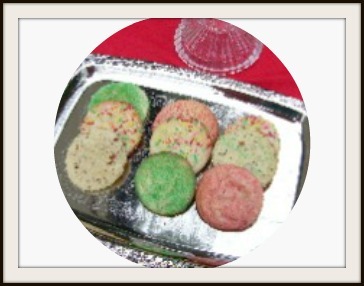 Spry Christmas Cookies is actually an old fashioned sugar cookie recipe that can be made anytime. When I was growing up, we didn't make sugar cookies by rolling them out and cutting them with a cookie cutter. We shaped the dough into balls and rolled them in sugar, then placed them on a baking pan. We flattened the tops with a glass and baked them. When I first made these cookies in 1945, Mama kept poking her hand in the oven to test if it was hot enough. Combine shortening and sugar and mix well. Beat in vanilla. Then beat in egg yolks until thickened and lemon colored. Chill dough about one hour in refrigerator. Shape into balls and roll in nut meats or colored sugar. Place 3 inches apart on a greased baking sheet. Bake at 350F. for 12-15 minutes, until brown around the edges. Carefully remove hot pan from the oven. Remove cookies with a sturdy spatula immediately and place on a rack to cool. When thoroughly cooled, store in an airtight container until ready to serve. *Spry shortening no longer exists. Substitute a "soft" vegetable shortening. said it was a triple creamed vegetable shortening. It was soft and creamy like room temperature lard. Almond Cookies - Add 1 teaspoon almond flavoring and 1/2 cup finely chopped almonds instead of pecans to the batter. Lemon Cookies - Add 1 teaspoon lemon extract and 2 teaspoons lemon zest to the batter. To reduce the sweetness of sugar cookies, use 2 tablespoon less sugar called for in the recipe. Eliminate or reduce the sweet decorations you rolled the cookie in. If you eliminate all the decorations and still want a colored cookie to match your party or celebration theme, add a few drops of food color to the batter before baking. To freeze these cookies, cut out circles of waxed paper or freezer paper and pack between each cookie to promote easier separation before thawing.